Stand up paddleboarding has gained a lot of love among the people. So many SUP variations have come up making the sport even more exciting. One such variation is SUP touring. It basically involves taking a tour on your SUP. Choosing a SUP board specifically for touring can be difficult because there are things you must take into consideration like speed and width. Luckily for you, there are boards that are built purposely for SUP cruising. They are usually longer for speed and a little wide for your gear and balance. The following are nine of the best touring paddle boards if you want to make your cruise a special one. 12'6 x 30" x 6"
12' x 30" x 6"
11' x 30" x 6"
11'8 x 31" x 6"
11'6 x 30" x 6"
14' x 32" x 8"
14' x 30" x 6"
Nothing says SUP touring board like a long and light iSUP. 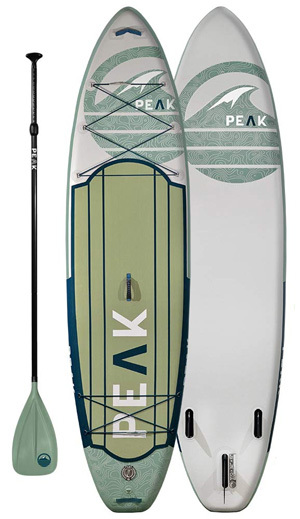 The Isle Peak Expedition is best suited for the adventurous paddleboarder— the one that loves to explore the water. It is 11” long and has a hybrid nose. These two features help with speed and slicing through the water. You should really consider this board if you are looking for a paddleboard that cruises smoothly. When the Isle Peak is fully inflated it only weighs 19.5 lbs; comparable models are 35% heavier. It is light enough to be carried by one person (there is a center carry handle). The width, 32” makes it easy to attain and maintain balance even for beginners and gives you enough space to keep your luggage. Speaking of luggage, there are bungee straps at the front and back of the deck to fasten your stuff. Check out all that the Isle Peak has to offer. Generally, the Isle Peak has been received well by customers. 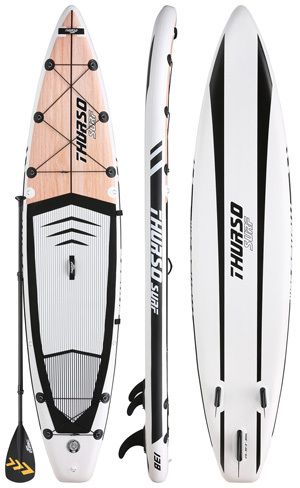 Because of its dimensions, it is a great board for all kinds of SUP variations and is especially perfect for touring. The bungee straps at the front and rear offer safety for gear. SUPers appreciate the accessory bundle. They also say that this board glides very smoothly and the speed is not that bad. Finally, the Isle Peak is pet-friendly; the soft top ensures comfort. The Nixy Manhattan is a superior board made with advanced fusion laminated dropstitch technology. This construction makes it lightweight without compromising on quality. It has been made to withstand all kinds of conditions without getting dings and dents. Additionally, this iSUP inflates up to 20 PSI. When fully inflated, it is as sturdy as an epoxy board. The Nixy Manhattan is available in two beautiful colors; red and blue. 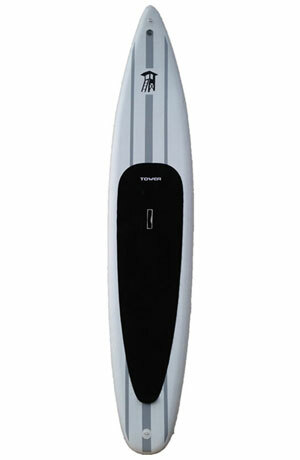 It comes as a complete iSUP package with an adjustable paddle, travel bag, leash, pump and fins. The bag is awesome and even has wheels making it perfect for touring. The paddle is adjustable 67” to 82”. Being 12’6 long and 30” wide, this inflatable board is unbeatable when it comes to speed and gliding through the water. The soft EVA pad on the deck will give you comfort even when you are in the water for hours. It also allows you to bring a kid or pet with you. For many customers, this is the best iSUP board decision they have ever made. As predicted, the Nixy Manhattan is fast. The way it cruises through the water is commendable according to the reviews. Thanks to the wheeled bag, paddleboarders can now explore their dream destinations. Between the board itself and the included accessories, the users feel that they got their money’s worth. The Airtech 11’ is a product of ISLE, a family of water enthusiasts from California. They are known for creating premium water products. This inflatable paddleboard is designed for the adventurous SUPer. It has 14 individual D-rings and bungee systems to help you strap your gear efficiently. The nose is ultra durable, just in case you bump into something. ISLE are awesome and they offer you a complete package. In the box there is a carry backpack, an adjustable aluminum paddle, a high pressure pump that inflates to 15 PSI and a removable travel fin. The technology used to make the ISLE Airtech is high-end and the result is a lightweight, stiff and tough inflatable SUP touring board. Customers seem to agree that this is a pretty good touring board. It tracks well and is super stable. Users have noticed (with appreciation) the multiple tie-downs on the ISLE Inflatable Explorer. Any touring SUPer knows that those are super important. Another great quality is that the touring iSUP is very durable. SUP touring is all about exploring the waters and that could mean going for very long distances, far away from the shore. 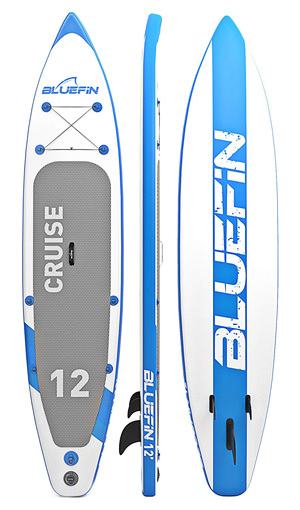 The Bluefin Cruise touring SUP ensures that those cruises never get boring. It can be converted into a kayak and the conversion kit is included in the package. The Kayak/SUP package includes kayak seat, repair kit, detachable fin, leash, carry bag, kayak/SUP paddle, pump and the board. There are two blades so you can easily switch the SUP paddle to a kayak paddle whenever you want. The Bluefin is available in three sizes; 10’8 x 30” x 6”, 12’ x 30” x 6” and 15” x 35” x 6”. The 15” one is suitable for tourers who like to go on adventures with their families or friends. It is also great for SUP yoga and Pilates. The Bluefin 12’ is built using military grade PVC and on top of that, overlapping seams for total indestructibility. Apparently, some users bought the 10’8 Bluefin and went back to buy the 12’ one— that is how good Bluefin iSUPs are. 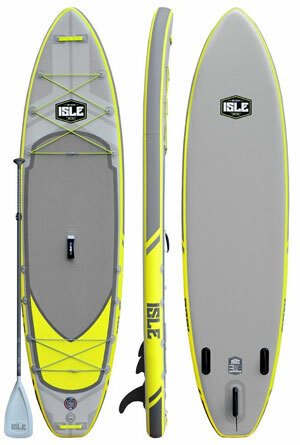 Reviewers say that the 12’ paddleboard is totally awesome. It is favorable for beginners as it is forgiving while trying to find balance. The sturdiness of the Bluefin 12’ is pretty much like that of traditional hardboards. It glides very smoothly and is great as far as speed is concerned. This one is a product of iRocker, a company that is famous for its awesome water products. 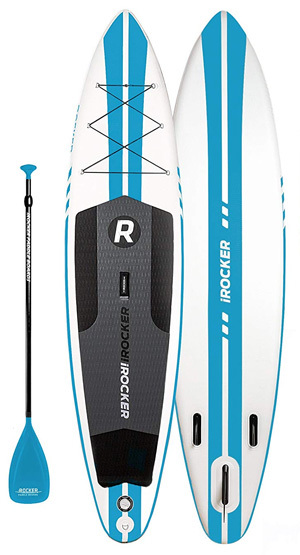 The iRocker Sport is one of the most rigid inflatable paddleboards that you will come across. It inflates to 15 PSI and does not bend in the middle or submerge in water. The 6” thickness also ensures this. The iRocker 11’ is neither too long nor too short. It is fast enough and at the same time, it is not difficult to control. The package includes all paddling accessories including a manual pump, repair kit, leash, carry bag and paddle. The paddle is made of fiberglass and is quite durable. Moreover, it floats so you can easily reach for it when it falls. An optional blade is available if you want to convert it to a kayak paddle. The carry bag is very large— it fits the included accessories and still leaves room for personal effects. Users could not be happier with their choice. The iRocker Sport 11’ makes a fantastic touring board. Its streamlined shape gives it an advantage over all-round boards. It glides very well and paddling it is such an easy task. Another thing that customers are happy about is iRocker’s customer service. Every complaint was taken care of in time. 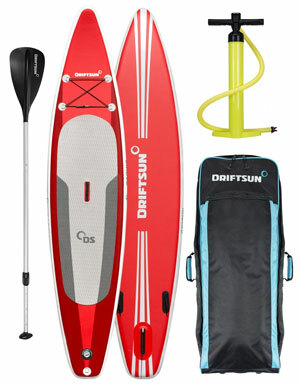 The Driftsun touring SUP is meant for intermediate and advanced paddlers. Besides being a touring board, it is perfect for racing and fitness paddling. Designed and manufactured by professional paddlers, the performance of this inflatable iSUP is unbeatable. The board has a displacement hull and pointed nose to efficiently cut through the water. This volatile 11’8” iSUP has a textured EVA deck pad to secure your footing and keep you from slipping. There is a bungee system to tie down your cargo. The package includes an iSUP, a backpack with wheels, a high pressure pump, an adjustable aluminum paddle, a leash, removable fin and repair kit. When fully inflated, you can easily mistake this inflatable for an epoxy board, except it is way lighter. The rugged military grade PVC that makes it allows you to be rough and adventurous without leaving dents and dings on the board. The Driftsun is a fantastic board. It is lightweight and easy to carry around. The bag is high quality as is the adjustable paddle. It is a stable board and can hold more than one rider. There are no negative reviews on the Driftsun. The Thurso Surf Expedition iSUP is designed specifically for SUP touring. It has a streamlined shape that significantly reduces drag and allows for effortless glide. Even though it is narrow to enhance speed, the 30” width still offers enough room for you to move around and for your luggage. There are adequate bungee straps both at the front and rear so you can carry all you need. The board is 6” thick which eliminates the inconvenience of submerging or worse still, bending at the middle. To ensure that this iSUP serves you for a lifetime, the manufacturer has used double layer construction and triple military grade PVC coating. You can be as wild as you want without worrying about punctures. The Thurso Expedition comes with a complete iSUP package comprising of a coil leash, paddle, pump, carry bag and three fins. The carry bag has wheels. The paddle is made of carbon, is super light and floats on water. It is adjustable 68” to 84”. According to the reviews, the manufacturer really cares about their customers’ experiences. Everything (the board and accessories) is well made and durable. The Thurso Expedition is easy to paddle and cuts through the water smoothly. SUPers have nothing to complain about. Designed for the SUPer who loves to push their limits, the Tower Xplorer iSUP has fantastic technical specifications. 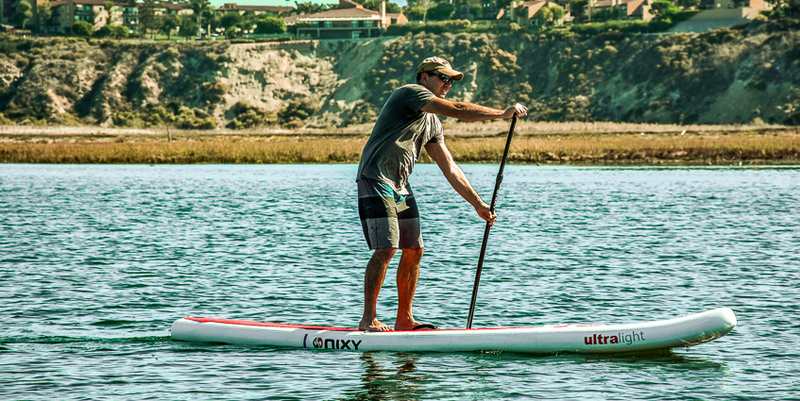 With unmatched speed and durability, your SUP trips are never going to be the same again. The Tower Xplorer is 14’ long and 32” wide to give enough surface area and stability. It is the first ever 8” thick board to be made. With this dimensions, you can strap most of your gear for an extra long SUP tour. Two people can comfortably ride on this board since it has a capacity of 700 lbs. The board comes with a three-piece adjustable paddle and a high pressure pump. The customers are thrilled. This board seems great. It is thick and wide offering stability. Despite the weight, it tracks really well and can even accommodate two people on it due to its capacity. The only downside is that you might have to pay extra on a plane. 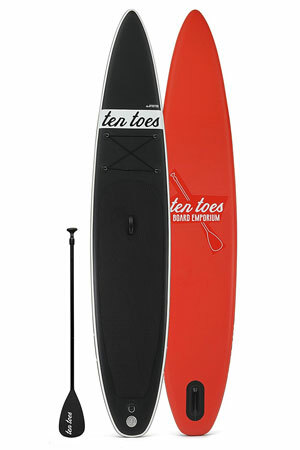 The Ten Toes Jetsetter is 14’ long and has a tapered nose making it the best for speed. It smoothly chops through the water while its 6” width helps you maintain stability. It is built with military grade PVC using the trusted Dropstitch technology, making it virtually indestructible. The EVA traction pad keeps you from slipping while enjoying your nice tour out in the water. There is a middle carry handle to help you carry the board across the beach with ease. Moreover, it has a bungee system and four stainless steel D-rings for your equipment. 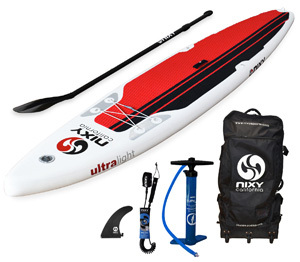 The package includes a Black Manual high pressure pump, three removable nylon fins, a repair kit and an adjustable three piece aluminum paddle; its full length is about 9’. A majority of the users would recommend this board. It is well made, cuts smoothly through the water and is really fast. The Jetsetter is a little heavy though. This review should help you narrow down your options and make a more informed decision. Your SUP tour does not have to be frustrating just because you could not get the right board. Even better, most of the best touring paddle boards above are all-round and suitable for all skill levels; which is awesome if you will be sharing your board. Pick the touring paddle board that wins your heart and have yourself a fantastic experience. SUP touring is one of the best experiences that you can ever have. It helps you clear your head and rejuvenate your soul, making you feel fresh and alive. Moreover, the health benefits of stand up paddleboarding are something you might not want to miss out on. It has been termed one of the best workouts. Getting started with SUP touring may seem easy—throw a few essentials on your board and just go. However, it is more complicated than that. There are a few things that you need to know and have before you go out into the water, whether it is during the day or night. In this article you will find the gear that you need, necessary precautions and basic tips for your first SUP expedition. Choosing an expedition SUP board is the most vital decision you will make in your planning—especially if you are entirely new to standup paddleboarding. Lucky for you, there are boards designed specifically for SUP touring, unless you want to use your board for other things like SUP yoga. In this case, you might consider an all-round paddle board. This one does not have a displacement hull and might be limiting in terms of speed. Cruising standup paddle boards are usually longer (ranging from 12 to 14 feet). Some even have a displacement hull for fast, straight tracking and a smoother glide in the water. Ensure that you get a board that has bungee cords for strapping your gear; this will come in handy. Another important aspect is the width and the capacity of the board. Remember SUP touring may mean being out in the water for long. You need a board that can handle your weight and that of all your gear. Manufacturers always indicate the board capacity, pay attention. It should also be wide enough for there to be room for your essentials and for balance. Whether to buy an epoxy touring paddleboard or an inflatable touring SUP largely depends on where you will be paddling. For white water paddling you better get an inflatable cruising SUP board. Renting a board is always a good idea so you can make a decision from experience. Stand up paddles are made of different materials. The lighter ones will be easy on your arms (especially if you will be paddling for long) but they are more expensive and can barely endure tough conditions. Heavier ones are cheaper and more durable. You need to consider your budget, the water conditions and the length of your trip here. As for the paddle length, it should be around 4 to 7 inches taller than you. Adjustable paddles are the best since you can vary the length depending on conditions. All your gear will be strapped on your board. The chances of water getting on it are very high—actually, getting water on your gear is inevitable because your board is more than likely to capsize. Dry bags may not be the cheapest thing in the market but they are well worth their price. Some things like phones, cameras and electronics are way more costly and should they get damaged, you will be counting your losses all through the year. The perfect idea would be to be to buy two dry bags (or more if you have the money). Have a larger one for everything; clothes, a sleeping bag, etc and a smaller one for electronics, snacks, sunscreen and other small essentials. You may be wondering what tools have to do with anything here. Well, you will be out in the water, it may be a long trip and you will be probably be alone. You can never predict what will happen. Must have tools include a GPS and a compass. If you will camp somewhere, remember to bring cooking material, tools for fixing stuff and safety tools. Be armed and prepared—you can never be too prepared. Researching before your SUP expedition is something you cannot fail to do. It is always great to know what to expect and be familiar with your route. Internet is one of the best things that ever happened to mankind; make use of it. If you have not picked a particular river yet, go online and search for navigable rivers in the area. Better still, see if someone has toured the river before and get in touch to ask questions. After picking out a river find out if it is seasonal and make sure the rapids and waterfalls are something you can handle on a touring SUP. There is a lot of mapping software that you can use to get even the smallest details about your route. Your safety cannot be emphasized enough. This is the one thing you should consider above all others. Never embark on a SUP cruise without a leash, a PFD, a whistle and a first aid kit. With a leash, you can never be separated from your board when you fall in, more so in a deep section. When things get rough you can count on your board to help you stay afloat; so you better make sure you can reach it. For extremely harsh weather, experts recommend two leashes, or a rope around your waist. If you brought so much on board, the leashes might give up the struggle. Even if you have planned a short trip, have an emergency kit and a float plan. Know how to use the kit; otherwise it will be just useless. Leave your float plan to someone you can rely on,either a friend or your family. As you research about your touring area, do enough research to know about the mobile/data coverage. It will be very unfortunate when you want help but cannot get it because there is no coverage. It is also very disappointing and frustrating when you are unable to share your journey on social media. Even with good coverage, a dead phone is of no use; know how you are going to charge your phone while out there. Buy a solar charged power bank if you have to. Usually, many people want to go on a SUP cruise to be alone with their thoughts. This is totally okay if it is a short day trip at a safe place. A night expedition, however, can be dangerous and in other instances your imagination will start working against you. It is comforting to know that someone else is watching your back in times like these. For a long day trip, it is also wise to have company. Sometimes the body just won’t cooperate and fatigue may kick in while you are in the middle of nowhere. What if you pass out? It is scary but it is a possibility you cannot ignore. You see, the thing with life is that we make plans knowing very well things might not turn out as expected. SUP touring is no different. Never forget that things may go south. You do not have much control; so have a backup plan. The key to making a good plan B is to carefully go over your original plan and figure out what might go wrong and where you might end up. Then come up with a scheme on how to get out of that situation safely. When you have a backup plan you will feel safe and prepared. With less panicking and more confidence, you can deal with the situation better. Even if your board is wide, stable and with a great capacity, do not get ahead of yourself. Before you throw anything in the bag ask yourself if it is really necessary; and even that which is necessary should be light and compact. Remember you are not moving, it is just a SUP trip—you will be back. It is good to talk to the people who live around your chosen route. They know things that you cannot find on the internet. Be nice to them and they will reciprocate. Ask them for more details about the area; the best spots, where to avoid, what to look out for and whatever else you want to know. They could turn out to be of great help. 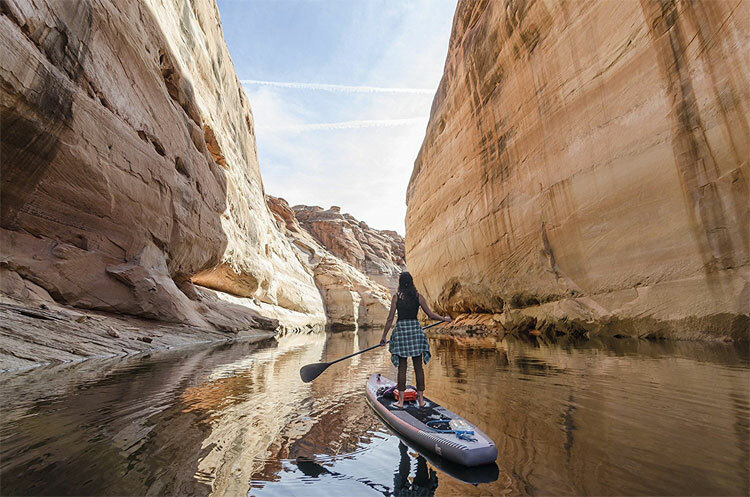 Taking a SUP tour is doing yourself a huge favor. Whether long or short, it is a great way to connect with nature and take your mind off things for a while. The best thing about it is that you do not need a lot to go on a SUP expedition. As long as you have a board, paddle, leash, PFD and a few necessities, you are good to go. Just make sure you do enough research, have a means of communication and bring a friend if you think it is important. Do not bring too much, have a plan B and pack light. Wherever you are going, be nice and friendly to the locals. Remember that your safety is your first priority. Finally, have fun and take lots of pictures!